Help responds to a need, brings its own blessing, and is part of how things are done in the context of poverty. 2. Who do the poor help – and who helps them? In short, one helps people who need help, are of high moral character, use help wisely, are thankful and who one is on good terms with and who one can trust. 3. What forms of help are used for what purpose? Help can be material (such as money, goods, or productive assets) or non material ( knowledge, physical/manual support, moral/emotional support or an intervention such as problem solving or conflict resolution. 4. Why do the poor help one another? People do not often think about why they help someone else. An impulse to help and the act itself can be informed by any combination of convention, a need, an event, a relationship or feeling. Motivation is multifaceted and complex. 5. How does a help transaction take place? First help is initiated with an offer or an ask (step 1). This is then screened for the person’s eligibility to be helped Screening is mediated by relationship both affinity and proximity (step 2). If the outcome of this filter is positive then there is an act of help (step 3). The terms and conditions surrounding it are established and a donation, intervention or act of sharing transpires. There is a donation, an intervention or an act of sharing (step 4). Next, the transaction is monitored. Adherence to the terms and conditions are rewarded, and noncompliance is sanctioned (step 5). 6. Has help changed over time? Analysis of the above findings brought to the surface five key dimensions of how the poor help themselves. 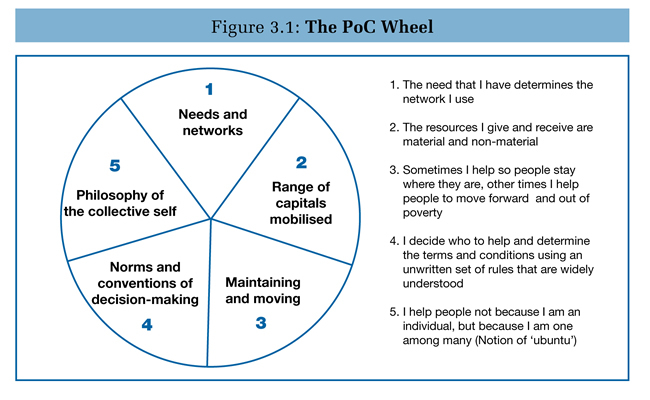 These form a philanthropy of community wheel. 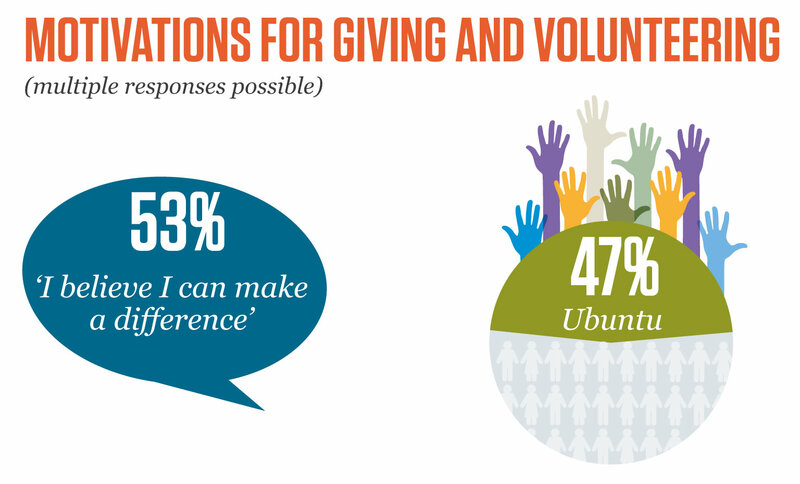 Surveying giving and volunteering patterns of ordinary south Africans is part of the research undertaken by Charities Aid Foundation Southern Africa (CAFSA). This report filled a knowledge gap on the giving of ordinary people: what they give, how they give it (whether directly or through an organisation), who the giver or volunteer is, and the motivations for donating.